Epaderm Ointment is developed by dermatologists and recommended by doctors. Fragrance, colouring and SLS free. 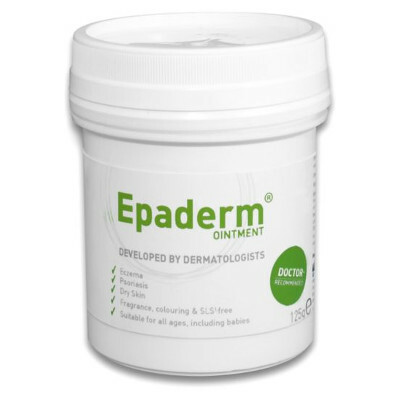 Epaderm Ointment is a highly effective emollient developed specifically by Dermatologists and prescribed by GP’s to manage all dry skin conditions. The unique Epaderm formula offers three aspects of complete emollient therapy in one for the management of eczema, psoriaisis and dry skin conditions. It can be used on the skin, as a bath additive or as a skin cleanser. Epaderm Ointment creates a barrier which aids moisture retention within the skin as well as helping to soothe the skin and reduce the itch. Epaderm Ointment contains only 3 ingredients, and is free from steroids, SLS, fragrances and colourings making it kinder to already sensitive skin. Ointments, like Epaderm, are the most effective emollient. However, they can feel greasy and may not be cosmetically acceptable all of the time. They are highly effective on very dry or cracked skin when used at night for long-term moisturisation. Epaderm Ointment is suitable for all ages, including babies.